Le Coustalou has grounds extending to nearly 4 acres. There is an extensive lawn with planted borders, trees, shaded areas for children to play and open sunny area by the pool. The gardens open up to a large field and beyond, woodland with beautiful walks. 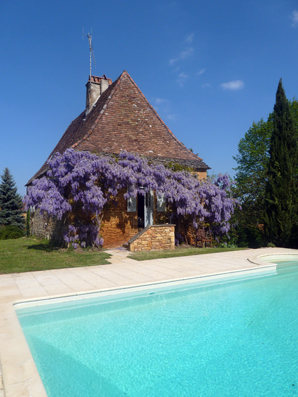 Le Coustalou also has a 5m x 10m salt filtration swimming pool with roman steps and external south facing decking/terrace adjacent to the pool. Sun loungers, garden table and chairs, parasol and barbeque are all provided for you to enjoy those hot summer days and evenings. Bicycles are also available for you use to explore the stunning countyside that surrounds Le Coustalou.